Former Darlington FC chairman George Reynolds has been jailed for three years for cheating the taxman out of more than half a million pounds. Reynolds, 69, of Monument Court, Nevilles Cross, Durham, and his cousin Richard Tennick, 59, admitted carrying out the tax scam between 1998 and 2004. Tennick, of Manfield, North Yorkshire, was sentenced to two years in prison. Reynolds and Tennick had pleaded guilty to cheating HM Revenue and Customs out of £650,000 in unpaid tax. Other charges, including liability by deception and money laundering, which they denied, were ordered to lie on file. I accept you are a ruined man living in much reduced circumstances. The court heard how Reynolds had emerged from childhood poverty in Sunderland to amass a £260m fortune. He had spells in and out of prison as a young man for safecracking and burglary. But his wealth bought him a house next door to the Spice Girls in London, a yacht, Spanish villa and a fleet of cars. 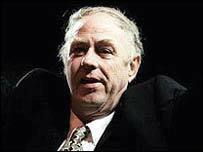 He invested about £27m in Darlington FC and had a dream of taking the club into the Premiership. It included moving the club to a £20m new ground. But the dream collapsed in January last year when the club went into administration and Reynolds quit as chairman. The court heard how Reynolds was now almost penniless having sold the houses, cars and yacht. Investigations into Reynolds' finances began after police recovered £500,000 in cash from his car last June. Judge Guy Whitburn QC said it "beggars belief" that Reynolds and Tennick did not know they had to fill in their own personal tax returns. He said: "I accept you are a ruined man living in much reduced circumstances. "Your investment in the stadium project cost you your fortune but it was not quite as altruistic as you make out. "This was a very serious cheat of the Revenue in a sum in excess of £400,000." The judge told Reynolds he had five years to repay the £424,252.50 or face a consecutive five-year prison sentence. Tennick had three years to repay the £225,747.50 or face a three-year consecutive sentence.